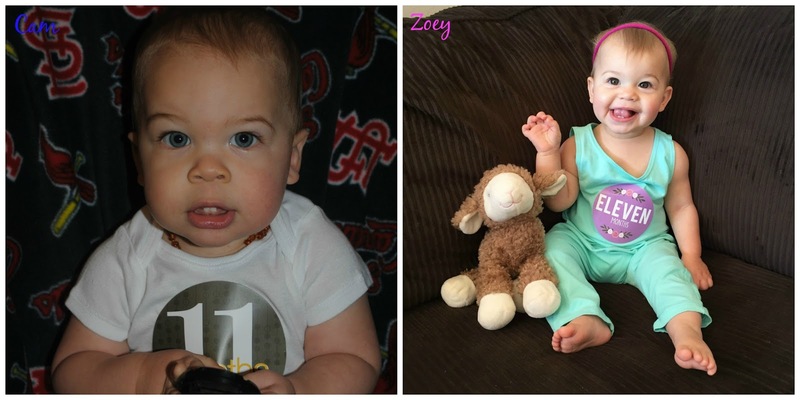 I literally feel as though I was just typing out Zoey's 10 Month post. April flew by and I am not super happy about it. 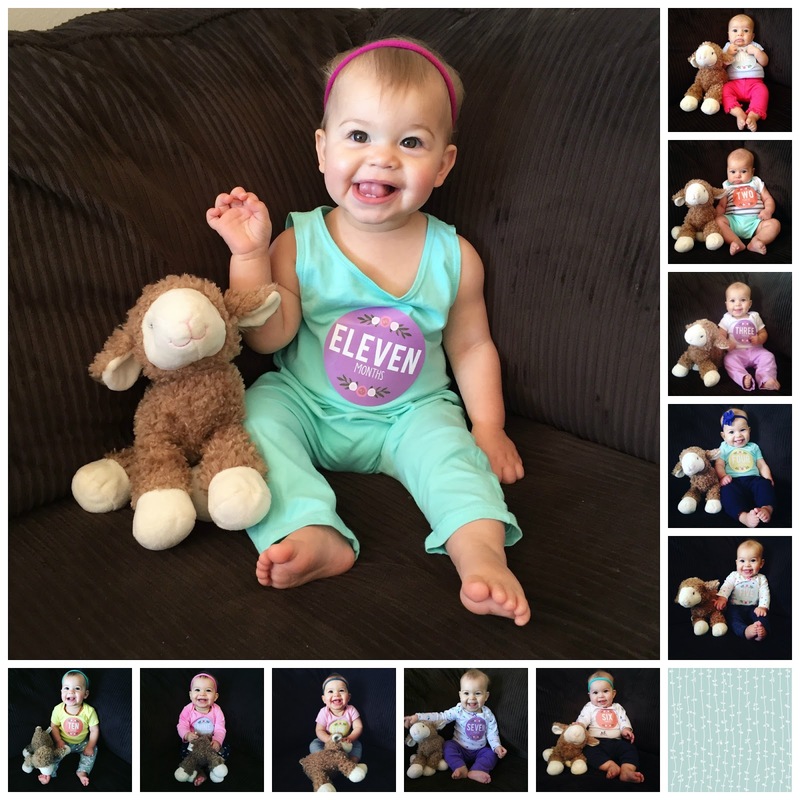 The countdown to her first birthday has begun. - The petite princess still wears the crown. Last week her weight was 18 pounds 5 ounces but I have no idea how long she is. - Fits into 9 month and 6-12 month clothing. We still roll a lot of pant legs. - Happy and chill until you take away her toy or keep her from doing whatever naughty thing she was doing. Then she's not very happy and really quite dramatic. - Pulls herself up on everything, climbs on anything she can, and cruises along the furniture. - Can stand unassisted but mostly has no interest in taking any steps. I say mostly because she has taken a few steps in the last few days. - Is crazy about the push car and loves to walk behind it and scoot herself along while sitting on it. - Is crazy busy. Her favorite activities include getting into the dog's water bowl, climbing the stairs, climbing into the entertainment center, and putting anything she can find into her mouth. - Being told "ah ah" (no) only makes her crawl faster towards whatever it is she shouldn't be crawling to (i.e. dog's water bowl, the stairs, the entertainment center). - Had pneumonia for the second time and was not at all interested in having her breathing treatments. - Still has only four teeth (two on top, two on bottom) but I think the next top two will be along soon. - Hasn't met many foods she doesn't like and most of the time eats as though it's been days since she was last fed. - Has started head butting and this is my least favorite development. Usually my nose or my mouth are the recipients and she thinks it's a hoot. - Puts phones, remotes, and the baby monitor up to her head and says "hi." - Claps when you say "yay" and has very recently started waving hi/bye. - Has discovered her tongue (as evidenced in her official 11 month portrait). - Signs "all done" when she is done eating. Or when she was over her breathing treatment. - Wants to do whatever Cam is doing, play with whatever he's playing with, and eat whatever he is eating. You can tell she thinks he's the best thing ever. And he thinks she's obnoxious. They do have some sweet moments together and when they make each other laugh it is the sweetest sound I've ever heard. - Sister is going to be a tough cookie thanks to her big brother. Oh, Zo Zo. I love you so.